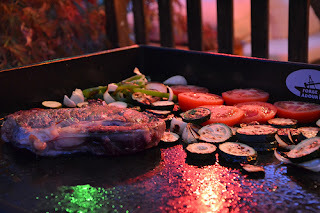 Behind the French Menu: The Plancha or Planxa in French Cuisine. The Plancha on French Menus. 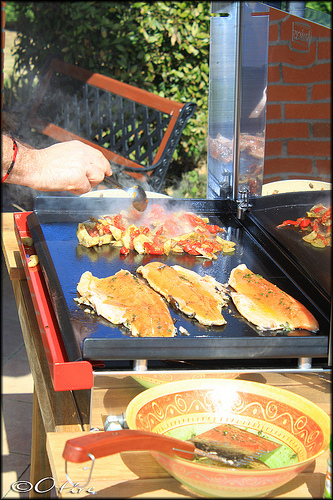 The Plancha or Planxa in French Cuisine. 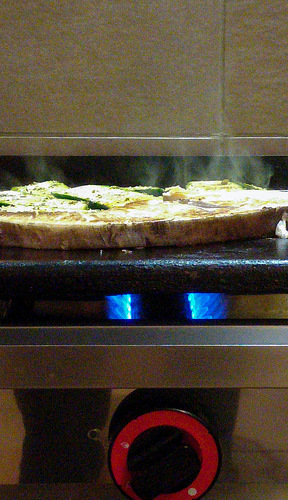 The Plancha on French Menus. 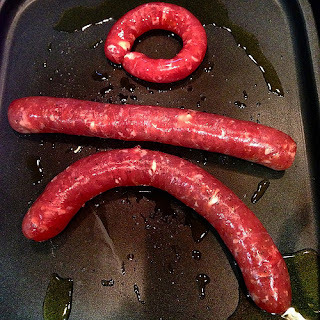 The plancha/planxa is part of many southern French and French Basque recipes and provides unique tastes that cannot be obtained with traditional frying or grilling. The plancha is an iron sheet, almost one and a half centimeters (0.6”) thick that provides a very even method of cooking that uses very little oil and results in a taste of its own. 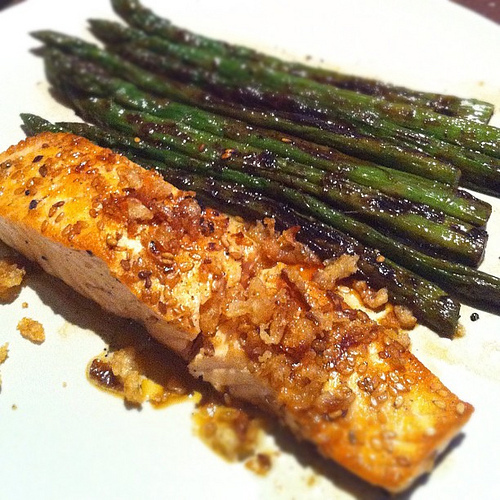 The invention of the plancha is claimed as their own by the Spanish, the Basques, and the French. Mesclun aux Agrumes, Pavé de Saumon à la Plancha – A mixed green salad with citrus fruit accompanied by a thick cut of salmon cooked on the plancha. Crevettes Ail et Persil a la Plancha – Shrimps cooked with garlic and parsley on the plancha. 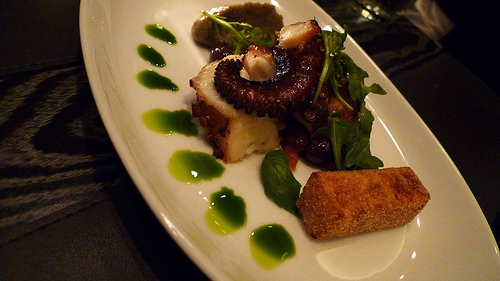 Octopus on the plancha with eggplant, tomato, crispy panisse, basil oil. Le Magret de Canard à la Planxa – Duck breast cooked on the planxa. Filet of salmon and asparagus cooked on a plancha. Chorizo à la Planxa au Cidre Basque – Chorizo pork sausages cooked on the planxa with Basque cider. Who really created the plancha, planxa? The original creation, at least the one that sounds the most probable has the idea down to a blend of early Mexican, Aztec and Maya cooking methods mixed with the addition of Spanish ideas. Their corn bread was cooked on flat clay plates heated from below, then with the arrival of the Conquistadors, an iron plate was placed on top. So the Spanish French and Basque probably owe the Plancha to the Central and South Americans and the Conquistadors. In Spanish, the word plancha means iron or metal or metal plate. In modern Spanish, a plancha is also a clothing iron, just as the word iron means a clothing iron in English. In Catalan, the language of Catalonia, (an autonomous part of North-Eastern Spain) the word is Planxa. In Basque planxa has the same meaning. So, white the plancha/planxa may not be an original Spanish, French, Catalan, or Basque creation it does provide delightful dishes. Cabillaud and Morue. Cod, the Fish; Cabillaud or Morue de l'Atlantique on French Menus . Morue and Stockfish Rehydrated Cod. Calmar, Calamar, Chipirons, and Encornets. Dining on Calamari in France. Espadon; Swordfish. Espadon on French Menus. Thon: Tuna, the Fish. Tuna in French Cuisine.